The answer is that the bear-related postings are a tradition dating back to 2009. Beginning in 2008, I began writing blog-like articles and posting them on Facebook. A year later, having ignored the first 12 of these Facebook posts, a close friend of mine, Mark Wojda, finally decided to read one. As chance would have it, the post Wojda chose to read was written entirely as an extended metaphor, leaving readers to ascertain the point themselves. Upon reading the post, an irate Wojda decided to protest the extended metaphor post by posting a picture of a bear (the subject of the metaphor) on every one of my future posts. For nearly two years, he has done exactly that. So, in honor of that tradition, and in order to provide a bit of variety and comic relief to this blog, Mark “villagebear” Wojda will be the first MTTC contributor. Once upon a time there was a primitive village. Along with all of the villagers, there happened to be a large grizzly bear living in this village. Now, this bear posed some difficulties for the villagers. It was so big that it was a bit clumsy. Sometimes it would knock things over, breaking them. Although it caught its own food, it scared away a lot of the animals that would have been around otherwise, making it difficult for the hunters in the village to find game. 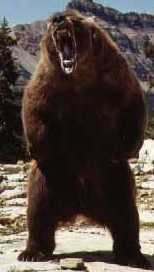 Also, the bear had a bit of a temper, which scared the villagers. The villagers had some weapons such as spears and sling-shots, and may have been able to kill the bear if they really wanted to. However, such an attempt was not certain to succeed and even if it did, the fight would have likely caused much death and destruction. Also, the bear’s presence was not all bad. The villagers did not have to worry about a major war breaking out with other villages. No other village would attack this one for fear of the great bear. Thus, the villagers and the bear lived together in relative peace and security. Of course, the bear understood the situation. It knew that the villagers were unlikely to attempt to expel it, so the bear did what he wanted when he wanted. There was a little troublemaker in this village who loved getting into mischief. One day this boy decided to throw a rock at the bear. The rock hit the bear right in the head. The bear only suffered a scratch, but it was furious. The great bear flew into a rage and devoured the young boy. When the boy threw the rock, there happened to be a young man passing by who saw the incident and started laughing at the bear. The bear saw the young man laughing and ate him too (the bear thought that the man had handed the boy the rock, but was mistaken). The villagers saw what was happening, and the bear growled at anyone who even looked at him, scaring the bejesus out of all the onlookers. The villagers just tried to stay out of the bear’s way for awhile, in order to give him some time to cool off. Eventually the bear did calm down, and things began to return to normal. At this point, a brave little girl decided that it would be fun to ride the bear. This girl slipped away from her parents, walked right up to the bear, climbed up and started riding the bear around. The villagers saw that the bear was letting the little girl ride him around and they were very happy that the bear was acting peacefully again. The villagers knew that they could not control the bear, but they liked to do everything they could to encourage good behavior. So, to encourage the bear’s decision to allow the girl to ride him, they put together some meat and berries and gave it to the bear as a gift. Of course, the bear could have easily killed and gathered his own food. Nonetheless, the bear liked the gift and was happy. Although the gift was unlikely to change the bear’s future behavior, the villagers could spare the food and giving it to the bear couldn’t hurt anything. Besides, they could always hope. YES! I am quite excited to be a part of the blog. I can’t believe it’s been so long since I’ve been posting bear pictures. I’ll have my end of the story up sometime in the next couple of weeks, I’m at the end of the semester right now so in a few weeks I’ll have a lot more time on my hands. Until then, enjoy. I, too, am now furious. WTF? I guess the nobel prize is the berries. But is the bear obama or America or what? Booooooo!!! I try not to interpret my own works of fiction.